Carlos Daniel De La Fuente walks handcuffed into the courtroom after being arraigned on one count of abuse of official capacity in the courtroom of Precinct 2, Place 2 Justice of the Peace Jaime "Jerry" Muñoz June 20, 2017 in Pharr. 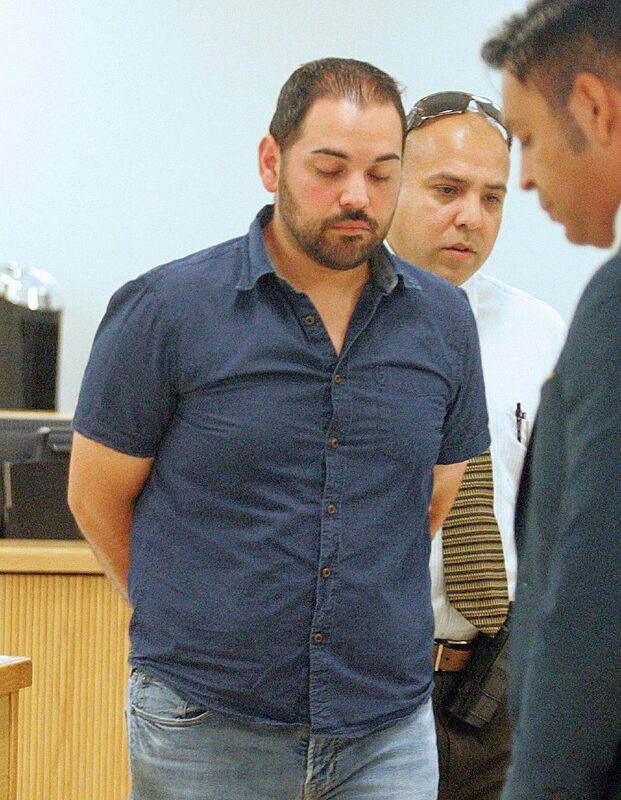 EDINBURG — Francisco Martinez was just a month away from completing his five-year-probation period when he inadvertently ignited a public corruption investigation within the Hidalgo County Adult Probation office. The man who held the strings to his liberty demanded cash from Martinez that would later lead to his arrest. Martinez was only about $930 away from paying his debt to society for a possession of marijuana charge when he was assigned a new probation officer in April: Carlos Delafuente. Delafuente turned himself in to the Hidalgo County Sheriff’s office Tuesday, where he was charged with abuse of official capacity, a state jail felony carrying two years of possible jail time. Sheriff’s investigators believe Delafuente took upward of $6,000 from probationers dating back to 2009. He would ask them for money on their last visits in order to discharge them without a remaining balance, according to a probable cause affidavit. When Martinez first checked in with him in April, Delafuente told him he wanted to help. “I’m going to try to help you, and you’re only going to pay $700,” Martinez recalled Delafuente told him. Martinez said he would bring the money on his next check-in date, May 16. A confused Martinez returned his call. But concerned with finishing his probation, Martinez told Delafuente he would drive back from the beach and give him at least half of the $700 because he couldn’t afford the total amount. Delafuente told Martinez he would take the cash to the courthouse and give it “to some lawyer or something,” Martinez recalled. Still, he didn’t want to question his probation officer. In hindsight, Martinez believes Delafuente was trying to intimidate him. “He told me he had friends that were lawyers. That if he got in trouble, if he were to need anything, he’d be able to get out of it real fast,” the 31-year-old said. After the meeting, a friend who had been waiting for Martinez asked about the receipt for the $350 he had just handed over to Delafuente, but the probation officer had not given him one. “You messed up,” his friend told him. Uneasy about the whole situation, Martinez decided to return to the Adult Probation office May 4. But this time he would go directly to the cashier’s window and ask about the payment he thought he made three days prior. “I asked for a receipt to see if they had deducted those $350, and they’re not reflecting,” he said. A worried Martinez called Delafuente to ask about the money. “Sir, I need a receipt,” Martinez told him. Delafuente tried to explain, but offered confusing information, Martinez said. At one point the probation officer told Martinez he would return his money. Concerned, Martinez’ friend who had accompanied him, approached Patrick, who happened to be smoking a cigarette outside, and asked him if probation officers should be collecting money from probationers. Martinez’ friend had no idea he was talking to the adult probation director. Patrick, who did not return calls seeking comment, asked the men if he could take their statement and escorted them into his office. Once there, Delafuente appeared with an envelope with money in it. Patrick would later take the information to Hidalgo County District Attorney Ricardo Rodriguez, who then forwarded it to the Hidalgo County Sheriff’s Office for further investigation. And although Martinez was not named in the probable cause affidavit, the document indicates a probationer came forward in early May and said he had given his probation officer a $350 partial payment to lower his fees. Delafuente resigned from his post, where he had worked for over a decade, soon after. Authorities later pulled his caseload and found other probationers with similar stories, and sources told The Monitor, other officers could face similar charges. Martinez is somewhat conflicted about the situation. On one hand, he wants nothing to do with the legal system and worries he’ll have to appear in court once again as a result, but on the other, he is glad to expose what may be corruption in a system that is meant to keep men and women honest. He’s just completed his five-year probation and can hardly believe how the end played out. “I was believing what he was telling me, and I was putting my trust in him. And I feel so naive for being that way, but I don’t know, I was trying to finish my probation and move forward with my life,” he said. However, he’s willing to come forward once more if need be. “If I really have to do it, and it’s for justice for a lot of people, I’m willing to do it,” he said. Probation taught Martinez many things, including a French word that he will not soon forget. This report was updated to reflect the correct spelling of Delafuente.